Taking Care of Your Eyes while Using a PC | Do You Know? Staring at the computer screen endlessly is the life style of many of us today. Most of us get so carried away with our work that we even forget to blink our eyes and totally neglect our eye health. It is no doubt that eyesight is one of the most vital blessings of nature. Need a proof? Then close your eyes for a couple of minutes and try to do your work. We bet you can’t! Blurred vision, eyestrain, burning and itching of the eyes, dry eyes and headaches (in sum you call them eye fatigue) are the common problems you face while working on a PC. So today we are requesting you to take some time out and focus on the health of your eyes. Here we have for you some useful tips that you can apply while working on your PC, which will help you maintain sharp eyesight. 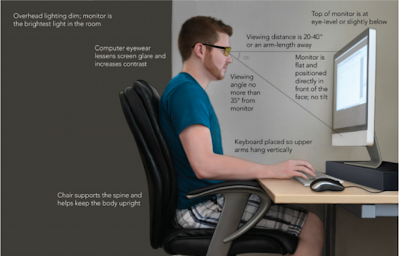 Your workstation should be at a height of at least 26 inches. The distance from the screen and your eyes should be between 16 to 30 inches. Some people find 20 to 26 inches distance comfortable enough. Make sure the screen is below your horizontal eyelevel, tilted at the angle of 10 to 20 degree. Keep your monitor screen away from dust and finger print free. Always choose a comfortable and adjustable chair, so that you may be able to maintain a reasonable distance from your PC screen and sit at an appropriate angle. Proper distances and angles help reduce the refraction of the eyes and also lessen tiredness. A five minutes break is suggested after every one hour. Just move your eyes away from the monitor screen and take a look at a distant target for at least 10 seconds. You can even close your eyes for a few minutes and give them some rest. You can try some eye exercises that will also improve your vision. Just rotate your eyes in clockwise direction for 3 times and then anticlockwise. It will help relax the muscles of your eyes. Keep your eyes wet by blinking them repeatedly. The constant blinking would help secret tears and help remove the dryness of the eye. This routine is very important especially for those who wear contact lenses. Eye drops are also available and can be taken on prescription for taking care of the dryness of the eyes. Also it is suggested to breathe regularly while working; this will accelerate your blood flow and help you relax. The uneven distribution of light in a working environment can cause glare. So it is important to remove all the factors that can cause glare, such as sunlight and other luminaries near your workstation. You can avoid glare from the sunlight by putting blinds on the window. The workstations should be placed between the rows of the luminaries. It is important to position the screen at right angles from the source of light. Sometimes glare can be caused by the reflection of your brightly colored clothes on the screen. You can use anti-glare screens as well to cover your monitor. Avoid working in dark rooms as it can strain your eyes. Choose the right Font SIZE! Again it is very important to choose the font and its size that is easily readable by you even at a reasonable distance. It is recommended to choose larger fonts as it will put less stress on your eyes. It is also important to set the higher contrast between the characters on the screen and the background. Try to eat foods that enhance the vision. Foods containing more of DHA are known to prevent eye injury and clouding of the lens called Cataract. Also food rich in vitamin A are very helpful. DHA is found in many sea fishes such as trout, salmon, sardines, Arctic Char and herring. Vegetables like carrots, pumpkin and sweet potatoes are rich in Vitamin A. Seeds like sunflower and watermelon seeds are very effective for improving vision. Fruits like mangoes and watermelon are also a rich source of Vitamin A.
Don’t forget to keep yourself hydrated; drink plenty of water it will also help to reduce the dryness of your eyes. We are sure that by incorporating these tips to your daily life you will overcome many problems that you encounter while working on a PC.